ARC is regarded as a trusted window, door repair and installation contractor in the North Georgia and Metro area. We pride ourselves on our knowledge and expertise of window and door repair and creative designer installation. 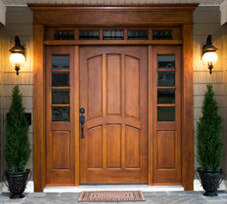 Contact ARC for replacing any interior or exterior door or window at your home or business. We can facilitate the needs of any size repair or replacement project. No job is too small or too extensive for our trained craftsman to complete to your satisfaction. Over time, age and harsh weather can warp and damage your window and door frames causing malfunction or rot. We can often salvage the framework and save the door or window set. Whether you desire a basic builder's grade door or a beautiful custom solid wood door, ARC is capable of meeting any of your door repair and replacement needs. Besides providing a safe and beautiful entry, doors provide security and protection from the harsh elements. ARC can replace your old doors with new energy saving doors that will increase the beauty and security of your home while reducing those rising energy costs..
ARC specializes in window installations and window repair. ARC has provided quality service on all major and minor window projects to the Metro-Atlanta and North Georgia area. Our experience and skills range from new construction and replacement installations to complex wood window replacements. Our contractors are available for a free estimate, so call now to get expert consultation tailored to your needs and project budget.